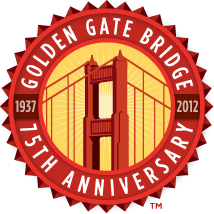 The Golden Gate Bridge's 75th anniversary was a spectacular waterfront festival! Thank you to everyone who joined us on Sunday, May 27, 2012, and to all our partners who helped make the day a memorable one! The main activities were held at Fort Point, Crissy Field, The Presidio and Marina Green. Anniversary activities were also held at Fort Mason Center, Ghirardelli Square, San Francisco Maritime Historical National Park, Fisherman’s Wharf, and Pier 39. Fireworks. A spectacular grand finale showcased the Bridge, Bay and surrounding national parklands. Soundtrack aired live on KFOG 104.5/97.7FM. International Orange Artists’ Exhibition at Fort Point. Crissy Field Stage highlighted dance, music and local bands. Road Trip through History featured vintage cars and motorcycles from 1937 to the present. Crissy Field Center Future Fair with activities and demonstrations showcased sustainability technologies and innovations in the pioneering spirit of the Bridge. Vintage Maritime Display and Historic Watercraft Parade with classic boats spanning 75 years, at the St. Francis Yacht Club. Marina Green Stage featured dance and music organizations and local bands. West Marina Green. Marina Green, Crissy Field and Golden Gate Bridge Plaza retail outlets offered Official 75th Anniversary merchandise. Additional anniversary activities were held at various locations along the San Francisco waterfront as part of the year-long Golden Gate Bridge 75 Tributes program. No Bridge toll dollars were used to fund the public celebration. Funding is provided by Genentech, Kaiser Permanente, Hewlett-Packard, Wells Fargo at the Tower level; Odwalla at the Cable level; and Chevron, Hanson Bridgett, Levi Strauss, PG&E, and Speck Products at the Builder level.